Anyone who knows us knows that Joe and I have a love of Spanish food, so much so that we're planning on going to Andalusia for our (first) honey moon next year. During the week, Joe decided that he wanted to indulge in a tapas feast on Saturday - spanning the whole early to late evening, with some nice drinks and relaxing. Cue some childish competition over who would cook what, and whose would be best!! Joe went for the sensible option and actually did some research before buying ingredients - I was a little bit more haphazard than that! I think that says a lot about us! On Friday, Joe went to the Kirkgate market, returning with clams, mussels, baby squid, pork loin and lamb's kidneys, all to be turned into tapas treats! We also picked up some sherry (it's very in vogue apparently!) 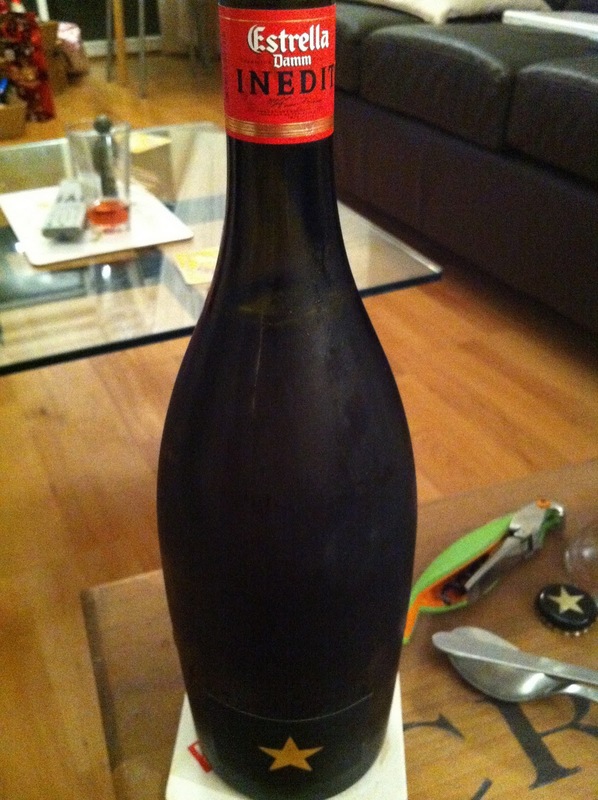 and some Estrella Daam Inedit from Harvey Nichols, to accompany our dishes. Estrella Daam Inedit is a Catalan Pilsner, made in conjunction with Ferran Adria of el bulli which is tipped as the first beer to be drunk specifically with food, like a good wine. It is a really tasty beer, and definitely one to try. I was first up. I made a chickpea, squid and clam stew, with tomato, garlic, chilli, lots of lemon juice and parsley. It was yummy - deep tomato and flavours of the sea. I am also a huge fan of chickpeas, which are much maligned still. This was then joined by patatas croquetas con jamon, also known as potato and ham croquettes! These were also pretty tasty, served with lemon and paprika mayonnaise. Piping hot, crunchy on the outside and soft on the middle, this was a good start. 2-0 to Jo Girl! A little bit later, Joe ventured into the kitchen! Armed with his internet research, he produced tigres (stuffed, roasted mussels) and pinchos morunos, which are marinated pork kebabs with paprika, chilli, lemon and cumin. The mussels were amazing - full of salty, sweet mussel flavour and a little kick of chilli. I've never gone in for mussels like this before, but I will definitely have them again. The kebabs were also very good and full of flavour. These ones came with the Estrella and it was a match made in heaven! Joe catching up on 2-2. After some exciting time watching the Strictly final (I was initially a Harry Judd fan but defected to Chelsee Healy during the night - she was robbed!) I went back to the kitchen to make the final dishes: chorizo in sherry and stuffed, breaded peppers. I'm not sure how Spanish the peppers actually are, but they were really tasty, stuffed with cheese, parsley and chilli. The chorizo was full of deep chorizo and sherry flavour, with a little bread for soaking up the juices. Yum. I'd say an overall win to Jo Girl: 3-2! By this time we were so full that the lamb's kidneys have been bumped! They will make a fine lunch another day instead.